In observance of International Day of the Girl Child, which will be celebrated today, an 18-year-old girl was on Tuesday given the opportunity to act as Guyana’s President. Renuka Persaud was selected for the opportunity after winning a video competition that was organised by the High Commission of Canada. 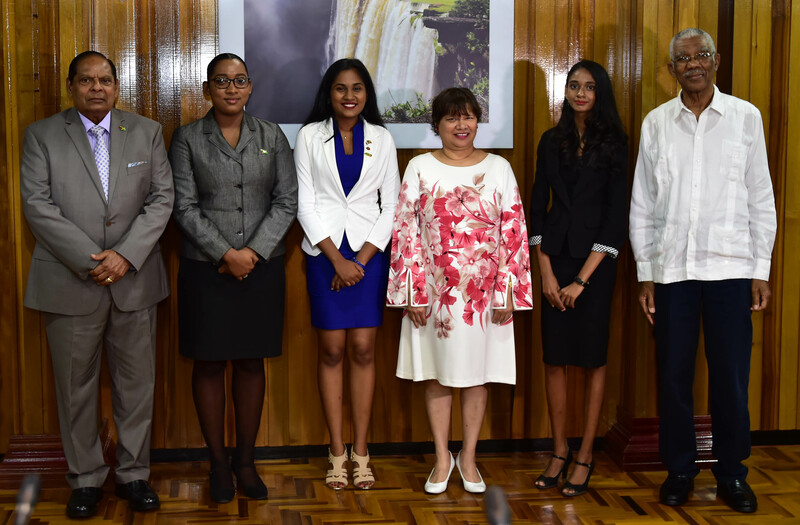 Two other young ladies, Delicia George and Sara Mohan, were given the opportunity to act as the Prime Minister and the Canadian High Commissioner to Guyana for the day, respectively. Persaud told Stabroek News that that she was grateful for the experience, which she described as incredible and one of the most memorable days of her life. “Apart from meeting the President, First Lady, Speaker and so many more amazing people, the highlight of the day was definitely when the President physically got up and handed over his seat at Cabinet to me,” she said. “It is a really great opportunity to have a girl in this position to speak for our own rights because that is what International Day of the Girl Child is about. It is about giving girls the opportunity to speak for themselves and to have their say,” Persaud was earlier quoted by the Ministry of the Presidency as telling the Cabinet during a courtesy call on Tuesday. Meanwhile, George, Prime Minister for the day, in her address to Cabinet, highlighted the need for women to pursue initiatives that can help them to become better individuals and contribute positively to society. “Women and girls are often not in high position. Some of the challenges and barriers for girls in Guyana are teenage pregnancy, the ‘glass ceiling’ and also unemployment, just to name a few. The theme for this year’s observance is ‘With Her: A Skilled GirlForce’ and because a lot of girls are sometimes ill-equipped, they are taken for granted; they are offered positions paying low amounts of money and I believe that if girls seek developmental opportunities, they will be able to break such barriers,” she said. The young woman then commended the initiative by the Canadian High Commission and the government and she advised young girls to believe in themselves and seek development. Mohan, in her address, called for more actions to be taken to conquer gender inequality and violence against women. The ministry said during the day the young women were given a tour of the Public Buildings, their respective offices and were even treated to tea with the Speaker of the National Assembly Dr. Barton Scotland. They also met with the First Lady, Mrs. Sandra Granger, at State House, where they discussed several topics, including the empowerment of women and girls, robotics, Information and Communication Technology, and Science, Technology, Engineering and Mathematics.